India is still reeling after 58 people, including children, were killed after a train mowed into a crowd of festival-goers last Friday. 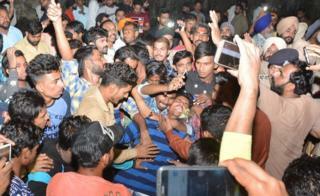 The crowd had gathered on railway tracks near the city of Amritsar in northern Punjab state and had no warning the train was headed their way. Few heard the train because of the sound of fireworks being set off. Officials have been trading blame but fury is mounting after the police complaint cited “unnamed persons”. “What had been a celebration turned into a horror show. There were so many bleeding and mutilated bodies,” Manjit Singh, one of the survivors, who just escaped the train’s path, told BBC Punjabi. 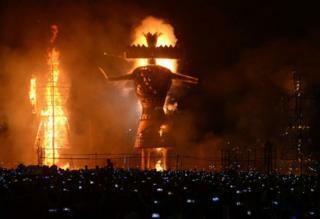 The crowd were watching celebrations for the popular Hindu festival of Dussehra, which involved the burning of a firecracker-filled effigy of demon king Ravana and a fireworks display. Eyewitnesses described how people searched for their loved ones on and around the railway tracks and in the bushes nearby with the help of light from their mobile phones. One woman caught a baby who was thrown into the air by a man just before he was killed by the train, according to The Times of India newspaper. Although the police have registered a complaint they have done so against “unnamed persons” as it is still unclear who is responsible for the accident. The event took place in a large field separated from the railway tracks by a wide ditch. A low wall marks the boundary of the field, and so by standing on the tracks people were able to gain a vantage point to watch the fireworks. The organisers had also installed large LED screens facing the tracks, suggesting that they had planned for people outside the field to witness the effigy being burnt. “People were sitting on the railway tracks and they were taking videos of the celebration,” Dr Navjot Kaur, a former state lawmaker who attended the event but left before the accident occurred, told BBC Punjabi. Railway officials have been quoted by local media as saying that it was dark and smoky and that the crowd had assembled after a curve in the tracks, making it hard for the train’s driver to spot them and react in time to avoid a collision. A video of the event that has been circulated widely shows one of the organisers telling Dr Kaur that five thousand people are standing on the tracks. “They are not bothered about the trains – not even if 500 trains cross the tracks,” he says. The organisers could not be reached for comment. Deputy Police Commissioner Kamaldeep Singh Sangha told BBC Punjabi that the organisers had written to local police to inform them about the event. He added that the police had given permission but had asked them to follow the Supreme Court’s guidelines for such public gatherings. The guidelines state that permission must be granted by the fire department, the railways and the health and safety department. 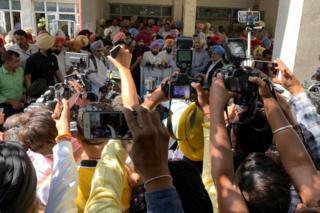 Officials from all three departments told BBC Punjabi that the organisers did not seek their permission. But survivors have said that officials had to have been aware of the event because it had been held annually for some two decades, with politicians attending. Punjab’s chief minister, Amarinder Singh, has ordered an inquiry into the accident and announced that the families of those who died will receive 500,000 rupees ($6,800; £5,200) in compensation. Police have admitted they are currently focused on helping the injured and dispensing compensation but say they will soon begin investigating to ascertain who was responsible. Has something like this happened before? Unfortunately, disasters resulting from a lack of preparation or poor management of crowds are not uncommon in India. And the deadliest accidents have occurred during religious festivals or gatherings, which often draw thousands of people. In 2015, 27 pilgrims died in a stampede on the banks of a holy river in southern India. It was attributed to poor planning as people rushed to take a dip in the river at a time they believed was auspicious. In 2013, some 91 pilgrims, mostly women and children, were killed in a stampede on a bridge at a Hindu festival in central India. Most were crushed after panic broke out amid a rumour that the bridge was collapsing and others drowned when they jumped from the bridge into the river below. But India is also home to some of the world’s largest annual pilgrimages, involving millions of people, and many of these events are praised for their organisation.